During his State of the Union address Wednesday evening, look for President Barack Obama to focus on solutions for the nation's No. 1 problem: The lack of jobs. Employment growth will determine whether the U.S. economic expansion continues and will likely also determine the fate of Democratic majorities in the House and Senate -- and possibly, the Obama presidency itself.Without question, the failure to pass (barring an unexpected, late coalition-building effort) the health care reform bill represents a major setback for Obama and the Democrats, one that has reduced the president's political capital. However, the probable health care reform failure would not mean the Democrats are doomed in November, or that Obama's presidency is over. To salvage the situation, they must solve the economic mess, which is the nation's biggest problem and one that's obviously at the forefront of investors' concerns, as well. And the reason is obvious enough: Voters hold the party in power responsible for solving the nation's problems. Economic issues historically have been at the top of that list. Solve an economic problem and voters will re-elect the party in power. Fail to solve it and voters will vote you out of office. By extension, a high unemployment rate dooms the party in power at election time. Investors should interpret last Tuesday's stunning victory by Republican Scott Brown in the Massachusetts U.S. Senate race as primarily this concern about the high U.S. unemployment rate and lack of job growth. True, post-election voter survey data will likely show that voters were also upset about the bank bailout, the automaker rescues, the uncertainty over the health-care reform bill and the fiscal stimulus package. But the most salient issue will likely prove to be the unemployment rate. In a nutshell, the Independents -- the swing voters in most elections -- gave most of their votes to Republican Brown, not because they're unemployed (although some obviously were), but because they feel they might be next to lose their jobs. Again, to be sure, some voters will express concern about national security and other issues. But the most important issue for most Independents is fixing the economy and stopping the layoffs so they can plan for their families' futures. Further, investors should pay little heed to talk of "the start of new era of conservatism" and "Republican dominance." It's way too soon from an electoral standpoint to draw those tenuous conclusions, but know this: If the U.S. economy doesn't start adding jobs soon, by say May or June, it will be the start of a new Republican era. However, if the economy starts creating jobs, you'll see most of those Independents reverse their January vote again and renew their support for Obama and the Democrats, as they did in November 2008. Independents are notorious for their lack of partisan loyalty. Heck, in many cases, that's why they didn't register with either party in the first place. There's an adage in political science that states "Independents aren't like baseball fans: Their vote swings back and forth." Therefore, if Obama and Congressional Democrats are smart (and they are), they'll focus with laser-like like attention on implementing policies that help create jobs -- be they fiscal, tax code-related or trade-related. True, other issues including national security, a war and other social issues can surface to influence the vote. But when the unemployment rate rises to a high level, it always ranks high on voters' list of concerns. Further, focusing on one issue will help the Obama administration prioritize its legislative objectives, an essential for any successful president. At best, an administration can accomplish only one or two big tasks in a year, maybe three or four in a four-year term. Perhaps due to the multitude of problems the administration faced as a result of the financial crisis, the Obama administration violated that Washington rule. The fact that they had a sub-par Year One legislatively speaking demonstrates why all administrations must obey it. 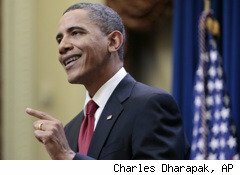 So in his address Wednesday, look for President Obama to focus on programs, strategies and incentives that create jobs and that improve the financial condition of the middle class. Further, don't look for Obama and the Democrats to try to court Congressional Republican support. Oh, there may be a public gesture or two toward achieving a bipartisan consensus, but the reality is bipartisanship is over for the foreseeable future. Sensing blood in the water after their Massachusetts victory, Congressional Republicans are more likely to advocate lowering the federal minimum wage than cooperating with President Obama in any constructive and substantive way. The Republicans have basically adopted the stance of conservative commentator Rush Limbaugh. They want Obama to fail, and if that stance takes the U.S. economy into deeper problems, so be it. Like the Democrats, the Republicans want to win in November and if winning requires not helping Obama, guess what? They won't. That's harsh, self-interested politics, you say? Well, that's today's partisan, polarized Washington. Now many investors might observe that, even with smart policy makers on their team, President Obama and the Democrats face a daunting task. After all, there's no guarantee, even with the best of stimulus programs and tax credits, that the U.S. economy will start creating jobs. And a lot will depend on when commercial activity gets to the point where sustained hiring is required. Without question, there are factors in problem solving that are beyond policy makers' control. But it nevertheless remains the responsibility of the president and the party in power in Congress to do their best to solve the problems facing the nation. Financial Editor Joseph Lazzaro is writing a book on the U.S. presidency and the U.S. economy.